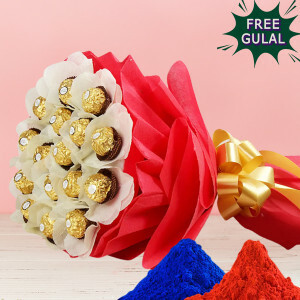 Spread your love with a splash the colors this Holi and celebrate the festivals of colors with your loved ones by sending the best Holi Gifts to them, online with MyFlowerApp. From effervescent flowers to delicious sweets, gulal, chocolates, personalized gifts, and more, get them all delivered swiftly, anywhere in India. 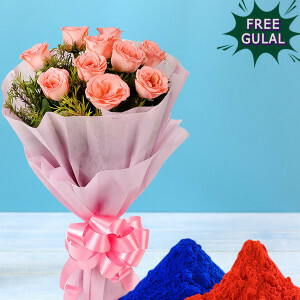 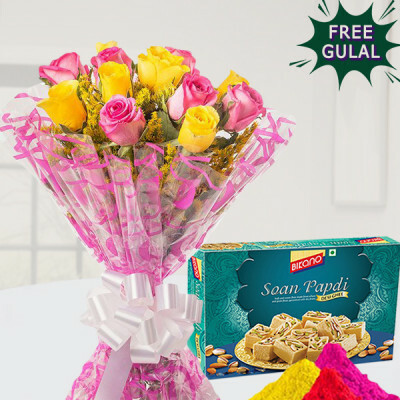 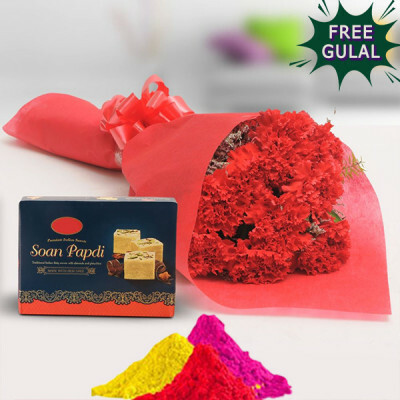 - A Bunch of Lovely 10 red carnation flowers wrapped nicely with colored packing paper, A Pack of 500g Soan Papdi with Gulal. 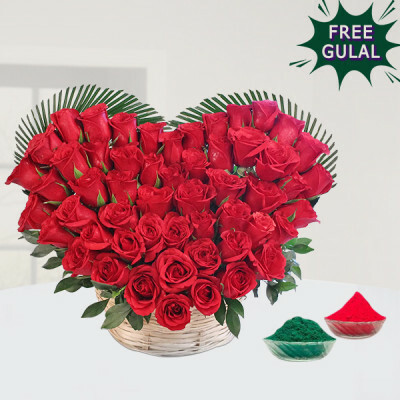 - A Bunch of 12 Mix Roses and 1 Kg Gulab Jamun with Gulal. - A Bouquet of 15 Pink Roses 1/2 Kg Pack of Mixed Dry Fruits in a Basket and Gulal. 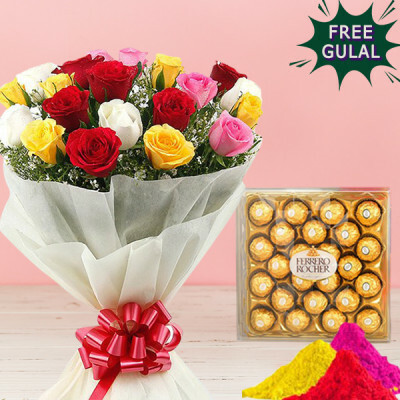 - 12 Mix Roses in Red paper packing as well as a delightful 1/2 Kg chocolate cake with 16 pieces Ferrero Rocher Chocolate pack and Gulal. - 8 Red Roses in Red Paper Packing, Greeting Card and 6 inch Teddy with Gulal. - 12 Pink Roses Bunch, 100 gm of Almonds, 100 gm of Cashew and 1 Kg of Gulab Jamun with Gulal. 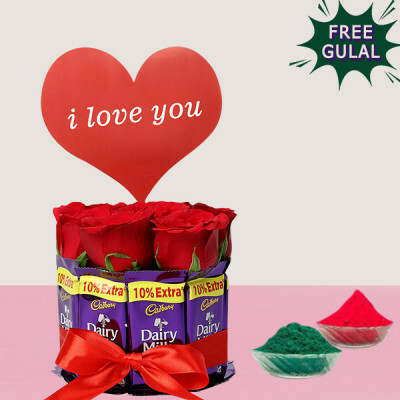 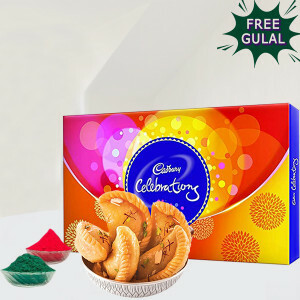 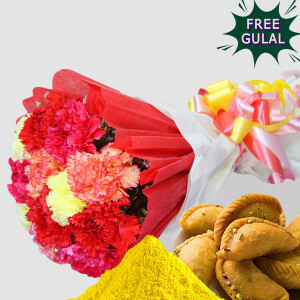 - 12 Mix Carnation Flowers and 500 gm of Gujiya with Gulal. - 12 Yellow and Pink Roses with Half Kg Soan Papdi and Gulal. 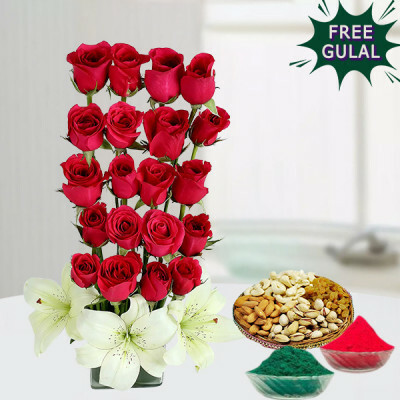 - An arrangement 20 Red Roses and 2 White Lily and Half Kg Mix Dry Fruits with Gulal. 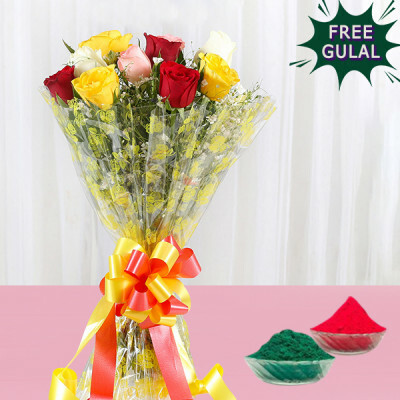 - 15 Yellow Roses with Half Kg Gujia and Gulal. - 10 Pink carnation in Pink Paper Packing with Gulal. 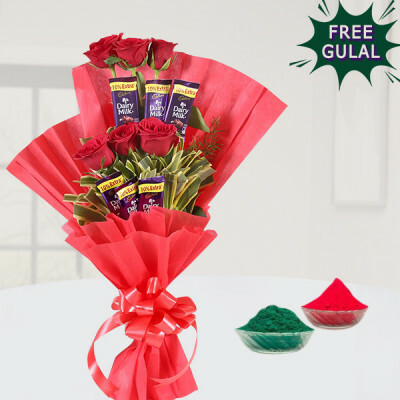 - This amazing hamper comes with 15 Red Roses 1/2 Kg of Gujjia Sweets and Gulal. 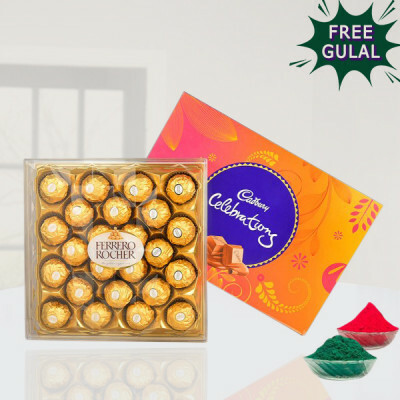 - Bunch Of Ferrero Rocher Chocolate 16 pcs. In Pink Paper Packaging with Gulal. - A bunch of 15 mixed roses packed in Red paper packing and Half Kg Chocolate Cake with Gulal. 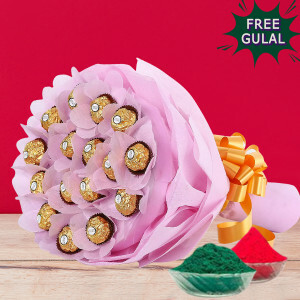 - A Bunch of 12 Mixed Roses Packed in White paper packing and 24pc Ferrero Rocher with Gulal. - This product includes 15 Yellow Roses Bouquet 1/2 kg of assorted dry fruits and Gulal. 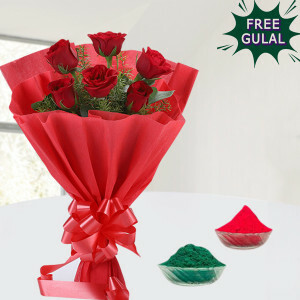 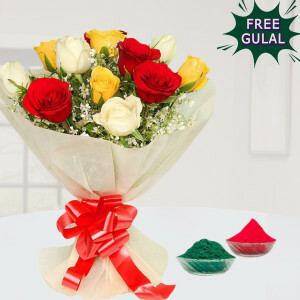 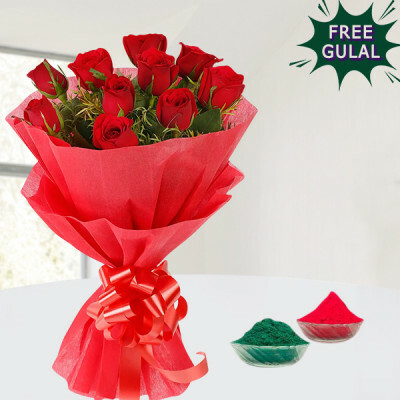 - A bunch of 15 mixed roses packed in Red paper packing and 250 GM mouth watering Gujhiya with Gulal. - Bouquet of 16pc Ferrero Rocher Chocolates with Gulal. 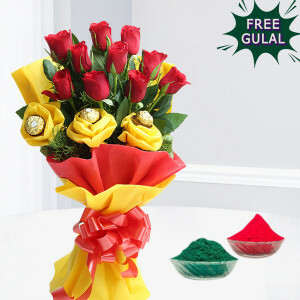 - A Bunch of 15 Yellow, Red and White carnations in Red and Yellow Paper Packing and 6 inch Teddy Bear with Gulal. 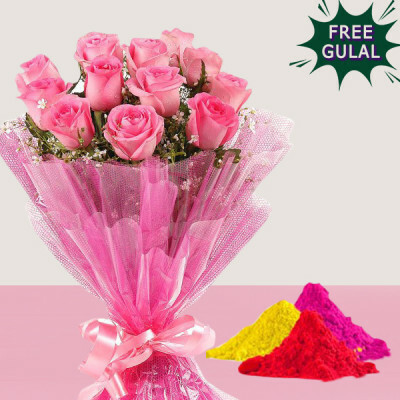 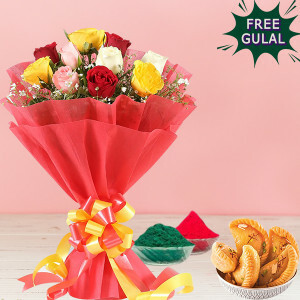 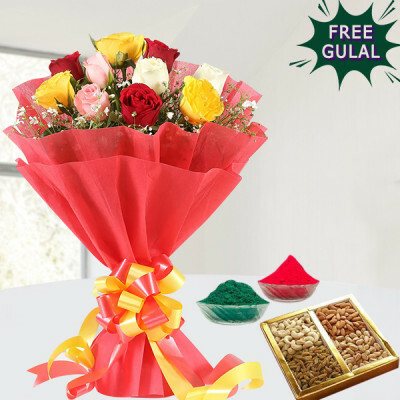 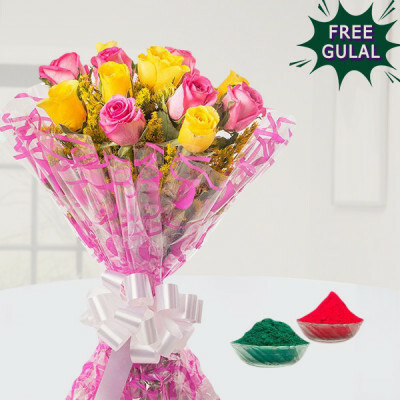 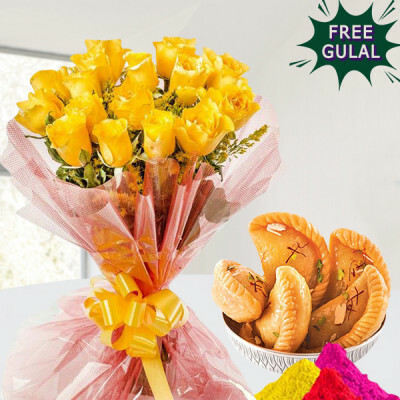 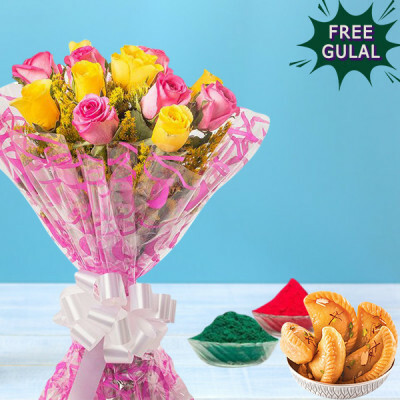 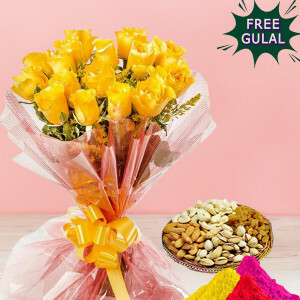 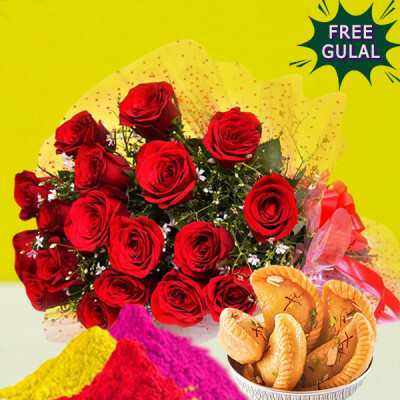 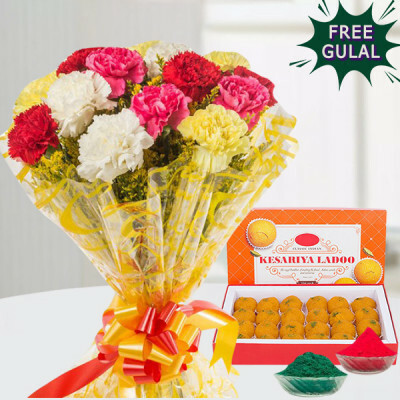 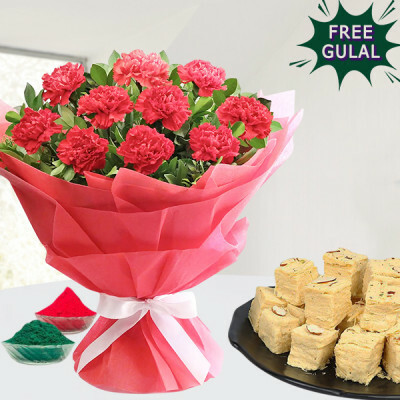 - 10 Yellow and Pink Roses Bunch and 500gm of Gujiya with Gulal. 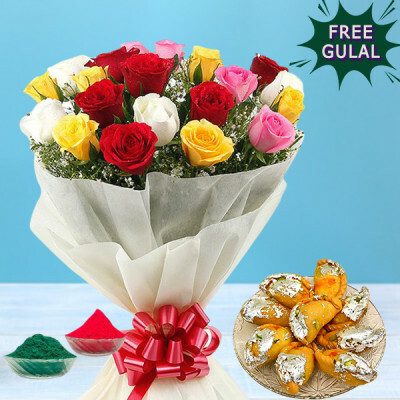 - 10 Mix Roses in white paper packing and Half Kg Gujiya with Gulal. 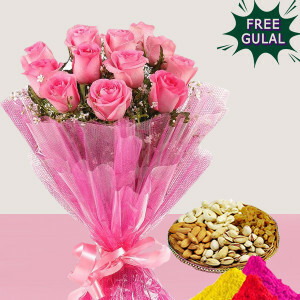 - 12 Pink Roses Bouquet in Pink Paper Packing with Gulal. 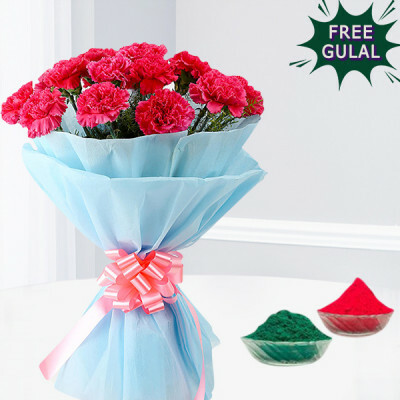 A bunch of 10 Pink Carnation Packed in Blue Paper Packing with Gulal. 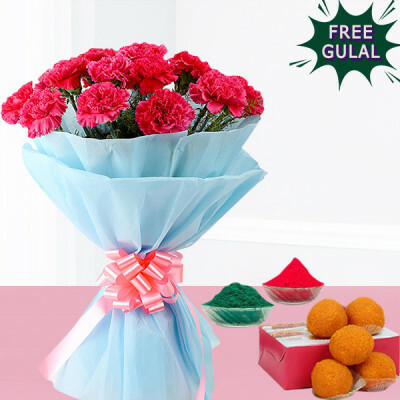 - A bunch of 10 Pink Carnation Packed in Blue Paper Packing and Half Kg Motichoor Ladoo with Gulal. 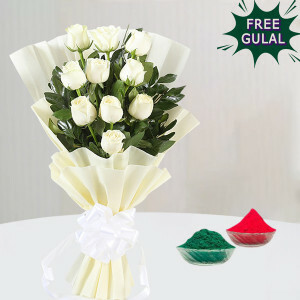 - 10 Mix Roses Bouquet With Gulal. - 6 Red roses in red paper packing with Gulal. 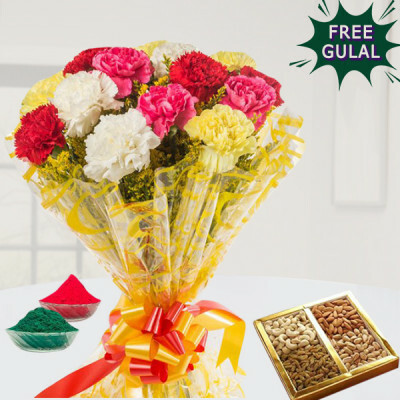 - Bunch of 10 mixed Carnations and Half Kg mixed dry fruits with Gulal. - This hamper includes 1 Cadbury 141 gm, 250 GM mouth watering Gujhiya and Gulal. - Bunch of 10 Red Carnations in Red Paper Packing and 1/2 Kg Soan Papdi with Gulal. 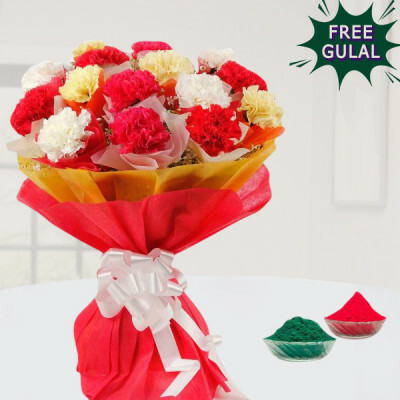 - 15 white, red and yellow carnations in red and yellow paper packing and Gulal. 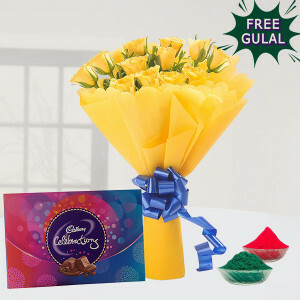 - One Cadbury Celebrations (121 gram) and A Pack Of 24-Ferrero Rocher with Gulal. 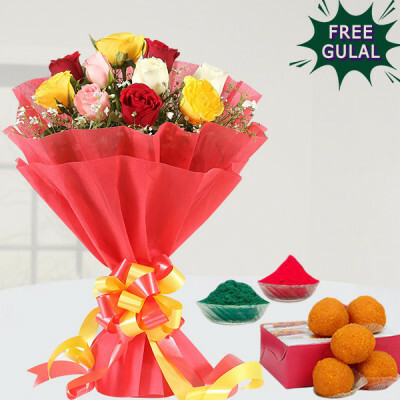 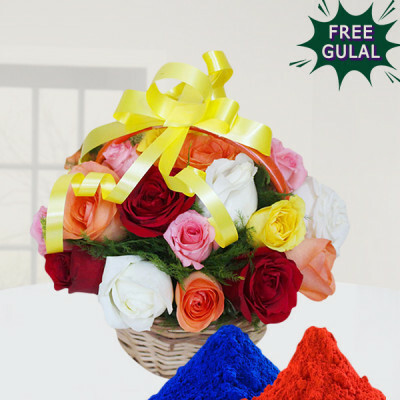 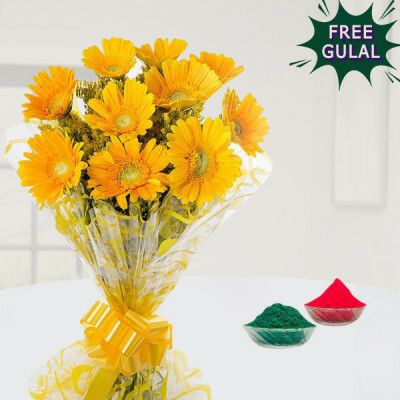 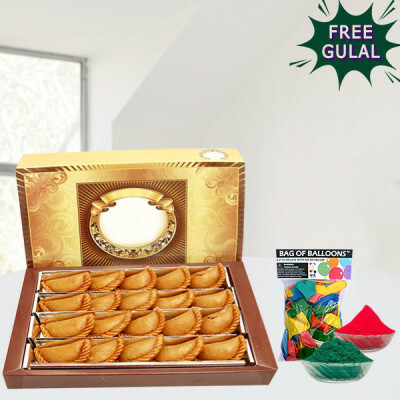 - This Hamper consists of 1 Kg Gujia, Gulal and 1 Ballon Packet.